Although water moccasins appear similar to copperheads, a water moccasin will often be speckled with color rather than colored in bands. Baby water moccasins also have a yellow tail. However, water moccasins tend to stay near water and do not venture too far onto land. Should you find a baby snake with the above characteristics far from a water source, it is probably a copperhead. Take extreme precautions when identifying snakes as copperhead bites can be deadly, especially to children. Observe the snakes through binoculars from a safe distance or seek a professional snake handler to assist you in identifying the snake. A member of the genus Agkistrodon, copperheads are often confused with water moccasins, another species of snake that belongs to the same genus. 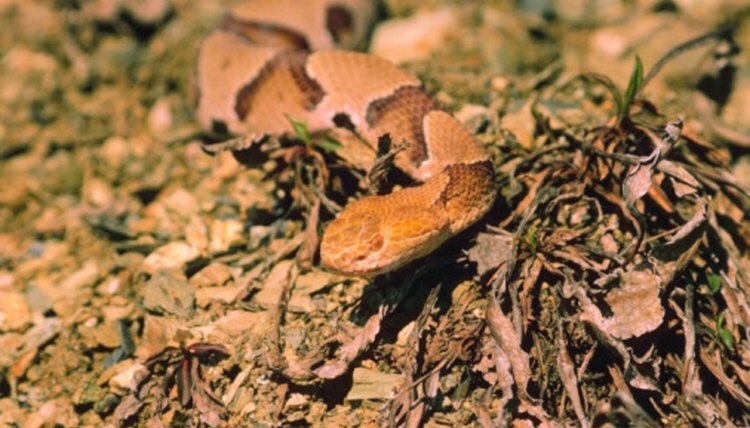 Learning to identify a baby copperhead is essential for outdoor enthusiasts, as their bites have been known cause long-lasting injuries to adults and are often lethal in small children. While both are found throughout the southern and eastern United States and share similar colorings, copperheads have a few defining characteristics, including the triangular shape and copper color of their heads. Inspect the head of the snake for a triangular shape, copper-red in color. This color is similar to the color of a penny and is distinct to the copperhead. Inspect the body of the snake. While the copperhead will vary in color depending on the region, its markings are similar to hourglass-shaped bands that span the entire length of the snake, typically darker in color on the outside and brighter in color on the inside. Inspect the sides of the snake’s head. As copperheads are pit vipers, they will have a heat-sensing “pit” located between the nostril and the eye on both sides of the head. Inspect the tail of the snake. A baby copperhead has a distinctive bright-yellow tip at the end of its tail, up to 1 inch long.